Mark Notation or simply Mark, is a new unified notation for both object and markup data. The notation is a superset of what can be represented by JSON, HTML and XML, but overcomes many limitations of these popular data formats, yet still having a very clean syntax and simple data model. The major syntax extension Mark makes to JSON is the introduction of a Mark object. It is a JSON object extended with a type name and a list of content items, similar to element in HTML and XML. You can refer to the syntax spec for details. Mark has a very simple and fully-typed data model. 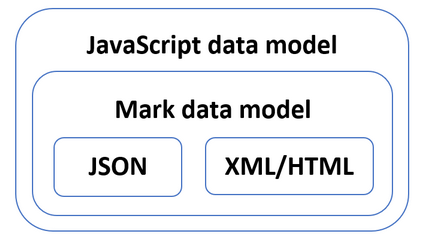 Roughly speaking, data models of JSON, XML, HTML are subsets of Mark data model, and Mark data model is a subset of JS data model. You can refer to the data model spec for details. Mark is a superset of JSON. It extends JSON notation with a type-name, and a list of content objects. It has a type-name, which is important in identifying what the data represents; whereas JSON is actually an anonymous object, missing the type name. It has built-in mixed-content support, which is common in all markup formats, and thus allows Mark to convenient represent document-oriented data, which is awkward for JSON. It incorporates some syntax enhancements to JSON ~(e.g. allowing comments, property name and value without quotes, optional trailing comma or between properties and array values)~, thus making the format more friendly for human. It does not yet have wide support, like JSON, at the moment. Mark is a generic data format, whereas HTML is a specialized format for web content. It does not have whitespace ambiguity, as the text objects are quoted explicitly. Thus Mark can be minified or prettified without worrying about changing the underlying content. Its properties can have complex values, like JSON, not just quoted string values as in HTML. It has a very clean syntax, whereas HTML5 parsing can be challenging even with HTML5 spec. It is always properly closed; whereas HTML self-closing tag syntax is non-extensible and error-prone. The DOM produced under Mark model, is just a hierarchy of POJO objects, which can be easily processed using the built-in JS functions or 3rd party libraries, making Mark an ideal candidate for virtual DOM and other application usages. Mark properties can have complex object as value; whereas XML attribute values always need to be quoted and cannot have complex object as value, which is not flexible in syntax and data model. Mark syntax is much cleaner than XML. It does not have whitespace ambiguity. It does not have all the legacy things like DTD. The data model produced by Mark is fully typed, like JSON; whereas XML is only semi-typed without schema. S-expression from Lisp gave rise to novel ideas like high-order composition, self-hosting program. The clean and flexible syntax of Mark make it ideal for many such applications (e.g. Mark Template, a new JS template engine using Mark for its template syntax), just like s-expression. The advantage of Mark over S-expressions is that it takes a more modern, JS-first approach in its design, and can be more readily used in web and node.js environments. The core module mark.js, which provides parse() and stringify() functions, like JSON, and a direct Mark object construction function Mark(), and some functional APIs to work with the object content. Sub-module mark.mutate.js, which provides mutative APIs to change the Mark object data model. Sub-module mark.convert.js, which provides conversion between Mark format and other formats like HTML and XML. Sub-module mark.selector.js, which provides CSS selector based query interface on the Mark object model, like jQuery. If you just want the core functional API, without the sub-modules, you can also use mark.core.js, which is only 7K after gzip. You can also refer to the package.json to create your own custom bundle with the sub-modules you need. You can take a look at all the test scripts, which also serve as basic demonstration of API usage. Mark Template: a JS template engine inspired by JSX and XSLT, using Mark for the template syntax. Mark VSC Extension: Mark Notation support for Visual Studio Code. Thanks to the following platforms or services that support the open source development of Mark: NPM, GitHub, Travis CI, Codecov, BrowserStack, jsDelivr, Plunker, JS.org.